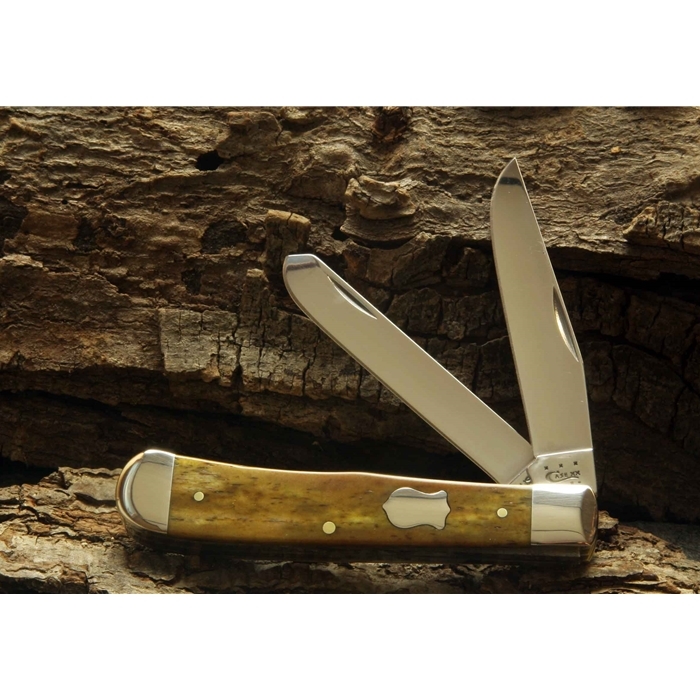 The Case Smooth Antique Bone handled Trapper is a classic. The hand rubbed finish brings out the beauty of the bone handle. With it's exceptional good looks and distinctive Case Badge Shield, this knife can be your Sunday dress knife or your everyday carry knife. The historic badge shield was the shield used by Case Brothers at the turn of the 20th century. The company’s rich history beganin 1889 when four brothers - William Russell (W.R.), Jean, John, and Andrew Case(a.k.a. “The Case Brothers”) began fashioning knives and selling themalong a wagon trail in upstate New York. W.R.’s son, John Russell (Russ) Case, aformer salesman for the Case Brothers brand, launched W.R. Case & Sonsaround the turn of the 20th century. We can engrave on the bone handle of this knife on the shield (mark) side. Please note that you are limited to 21 characters including spaces.